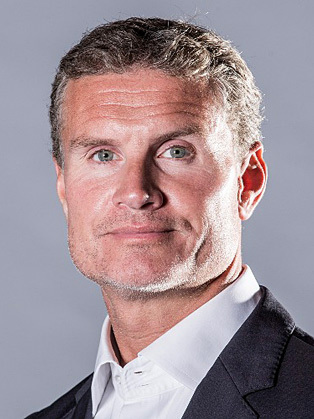 David Coulthard MBE dominated Britain's junior Formula Ford categories in 1989 and became the first ever recipient of the McLaren Autosport BRDC Award for young drivers. In 1991 he fought a titanic battle with future Formula 1 rival Rubens Barrichello for the British Formula 3 Championship, and won the prestigious Macau F3 Grand Prix. After moving to McLaren, David took his new team's first win in three seasons at the 1997 Australian Grand Prix. In all, he scored 12 of his 13 grand prix wins and 51 of his 62 podium finishes with McLaren, and, after supporting team-mate Mika Häkkinen to the drivers' championship in 1998 and '99, he finished runner-up to Michael Schumacher in 2001. In 2005 David moved to the newly formed Red Bull Racing team. By the time he retired from Formula 1, in 2008, he had notched up 535 points, making him the highest scoring British driver of all time. David stayed on as a consultant to Red Bull and also acts as an ambassador for Mercedes-Benz. Coulthard returned to racing as an active driver in the DTM series in 2010, piloting a 2008 Mercedes-Benz C-Class for Mücke Motorsport. Alongside competing in the DTM, David regularly appears as a pundit on BBC TV's Formula 1 coverage.